Allows you to set in which mode the application will start when executed. Filter : Application will be started by the filter view, so you can filter the records before the next application, that can be a Grid, PDF, Summary… you can configure that options within the Filter’s settings. 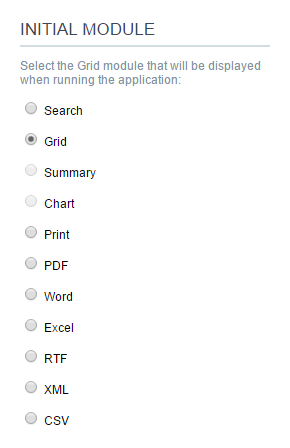 Grid : Application will be started by the Grid itself, this is the default option. Summary : Application will be started by the Summary. To use the Summary as initial application it’s mandatory to create at least one Group, using the Static Group By settings. Chart : Application will be started by the Chart. To use the Chart as initial application it’s mandatory to create at least one Group, using the Static Group By settings. Print : Application will be started by the print mode, according to the select command. PDF : Application will be started with the option to view or download a PDF file. Word : Application will be started with the option to view or download a Word file( .doc or .docx ). Excel : Application will be started with the option to view or download an Excel file ( .xls or .xls ). RTF : Application will be started with the option to view or download a RTF file ( .tft ). XML : Application will be started with the option to view or download a XML file. CSV : Application will be started with the option to view or download a CSV file. 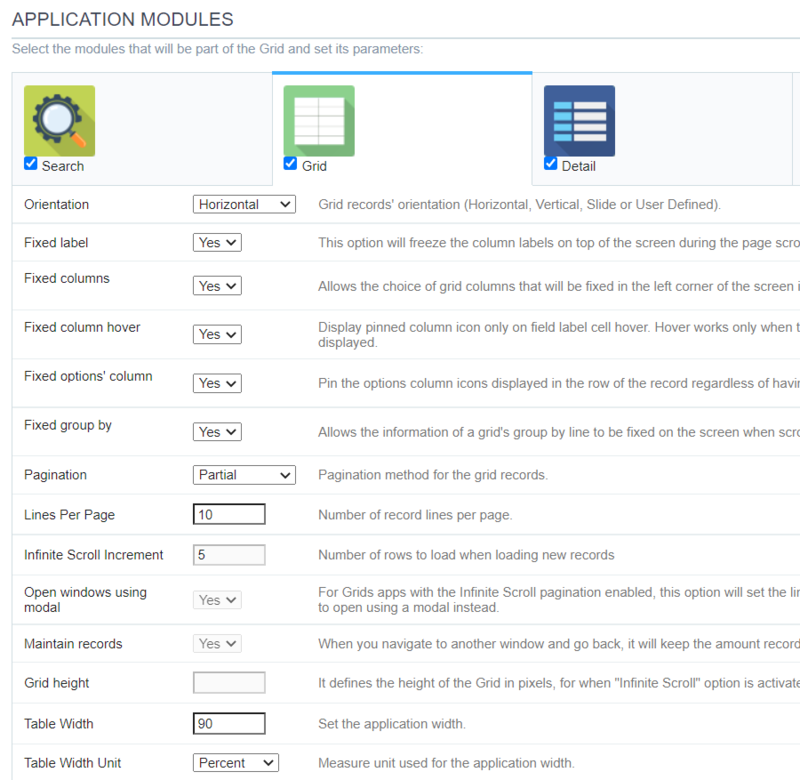 Filter Module : This option configures which application will be called after the Filter. Use Iframe : This option configures the filter to be displayed within an Iframe (displaying the Filter itself and the search results on the same page). This option is available only when the initial module is set to be the Filter. Show Results : Display the search results on the same page when loading the application for the first time when the “Use Iframe” option is set as “Yes”, otherwise, the results will be displayed only after the search. Iframe Height : Iframe height, in pixels, used to display the search results. 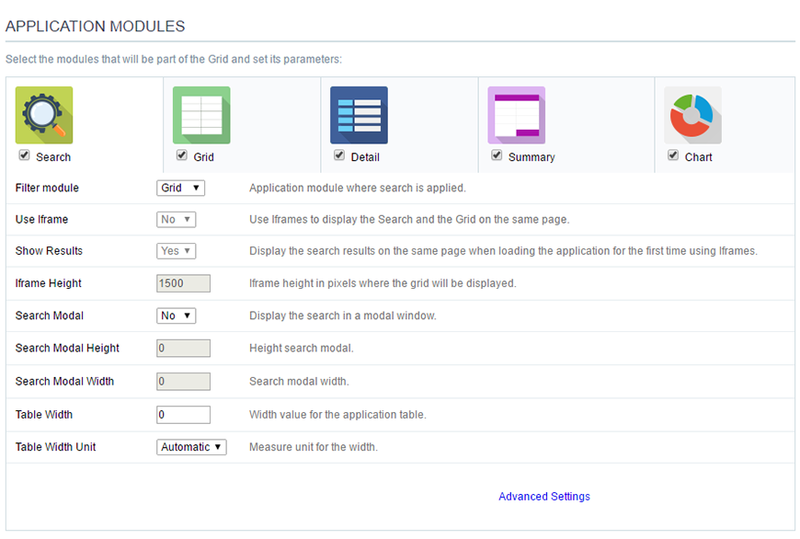 Search Modal : This option configures the Filter Application to open in a modal window. Search Modal Height : Search Modal box height (in pixels). Option available only when the Search Modal box is enabled. Table Width Unit : This option configures the unit for the table width (percent, pixel or automatic). The value itself must to be set within the option “Table Width”. 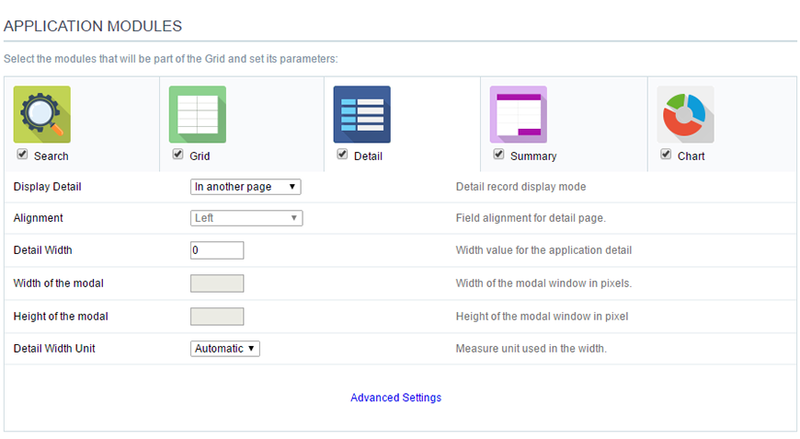 Orientation : This option configures the Grid records’ orientation (Horizontal, Vertical, Slide or User Defined). When using the “User Defined” option you can design the HTML manually inside the option “Layout » HTML templates” and select within the Layout settings. Fixed Label : This option will fix the columns’ label at the top of the page (it is only available when the Grud records’ orientation is set as Horizontal). Infinite Scroll Increment : This option sets the number of rows displayed on each increment of new records. It is available only when paging is configured with Infinite Scroll. Open windows using modal : For Grids apps with the Infinite Scroll paging enabled, this option will set the links between applications and details of the Grid, that are configured to open in iframe, to open using a modal instead. Maintain records : It configures if the amount of records displayed will be preserved when the application navigates to another window and go back. Table Width Unit : This option configures the unit for the Grid table width (percent, pixel or automatic). The value itself must to be set within the option “Table Width”. Display Detail : Allows you to set where the detail will open within the Grid Application * Beside the Grid : Displays the Grid Details to the right of the record, in the same window where Grid is being displayed. * Below the Grid : Displays the Grid Details below the Grid records, in the same window where Grid is being displayed. * In another page : Displays the Grid Details in another page, replacing the Grid view. * In another window : Displays the Grid Details in a separated browser window. * Modal : Opens a pop-up window to the display of the Grid Detail. Alignment : Using this option you can set an alignment (center, right or left) for the Grid Detail when it’s using the “Display Detail” setting as “Beside the Grid” or “Below the Grid”. Detail Width : This option sets the Grid Detail width when it’s using the “Display Detail” setting as “Beside the Grid”, “Below the Grid”, “In another page” or “In another window”. Width of the modal : Allows you to customize the Grid Detail width when it’s using the “Display Detail” option as “Modal”. Height of the modal : Allows you to customize the Grid Detail height when it’s using the “Display Detail” option as “Modal”. Detail Width Unit : This option configures the unit for the “Detail Width” (percent, pixel or automatic). Summary Display : Sets the Grid Summary display option ( On another page, On the last page, On every page). The Summary Application Module is only available when a group is created in the Group By settings. 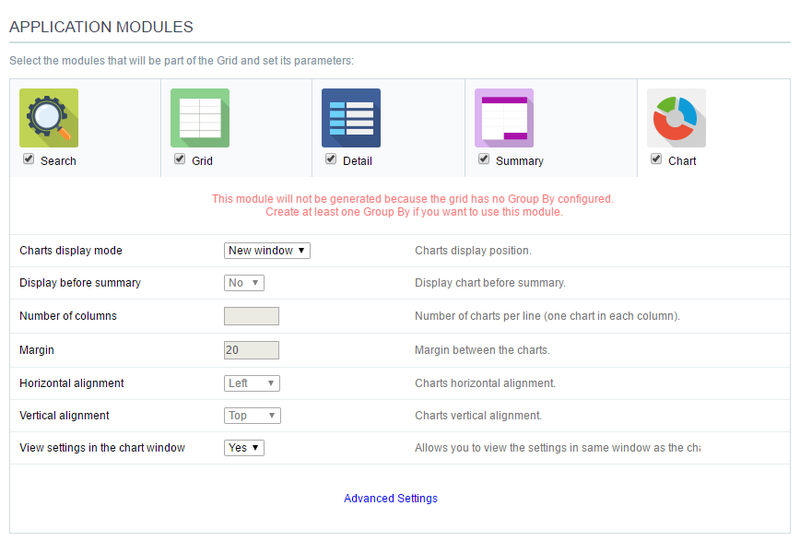 Charts display mode : Sets the Chart Summary display option ( New window, Same page, Other page ).The Chart Application Module is only available when a group is created in the Group By settings. Display before summary : Sets whether the Chart is displayed above or below the Summary. Available when the Charts display mode is configured in the Same page. Number of columns : Sets the Chart number of columns per line (one in each column). Available when Charts display mode is configured in the Same page. Margin : Sets the Charts horizontal margin. Available when Charts display mode is configures in the Same page. Horizontal alignment : Sets the Charts horizontal position (Left, Right, Center). Available when Charts display mode is configures in the Same page. Vertical alignment : Sets the Charts vertical position (Top, Center, Bottom). Available when Charts display mode is configured in the Same page. View settings in the chart window : Sets the chart settings display on the same page. Available when the Char display mode is configured on Other page or new window.